Posted Oct 29, 2018 by Eds. The White House’s Council of Economic Advisers (CEA) released a report earlier this week on “The Opportunity Costs of Socialism,” apparently based on the fact that “coincident with the 200th anniversary of Karl Marx’s birth, socialism is making a comeback in American political discourse,” even though Marx’s birth was in May (1818). 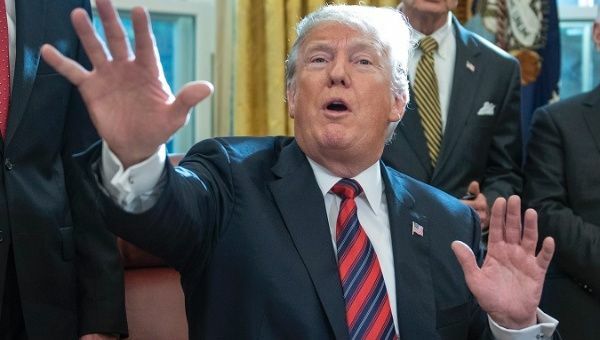 Reading through the report, it becomes abundantly clear that the Trump administration is afraid of this “comeback” of socialism in the U.S., as more left-leaning and self-proclaimed politicians are gaining space in the country’s politics. The Democratic Socialists of America has grown to more than 50,000 members, with socialist policies such as universal healthcare, free education, taxes on the rich and corporations, are being now supported by the majority of the U.S. population. The study equates this rise of socialism to the 200th anniversary of Marx, however, it conveniently “forgets” to mention the rise of fascism and discriminatory politics, ascendent since the electoral triumph of Donald Trump in November 2016. This “coincindental” report was published just before November’s midterm elections, as progressive candidates rise in the polls and are gaining popularity with more people. The CEA thought it would be a good idea to use tactics from the 1950s when the “red scare” and the “witch hunt” against communism and communists were a horrifying reality during McCarthyism. The report comes weeks before the elections, and weeks after a new study from the Pew Research Center unveiled that “six-in-ten Americans say it is the federal government’s responsibility to make sure all Americans have health care coverage, including 31% who support a ‘single payer’ approach to health insurance.” Whereas 30 percent of voters believe that health care is the “most important” issue, followed by jobs and economy with 21 percent, and immigration and gun policy at 15 percent equally for both issues. Republicans, represented by the Trump administration and the White House, are trying to minimize the rise of the “self-declared socialists (that) are gaining support in Congress and among much of the electorate,” which really explains the sole purpose of the CEA’s report. Why is it that our pockets are only empty when it comes to education and health care for our kids? Why are our pockets only empty when we talk about 100 percent renewable energy that is going to save this planet and allow our children to thrive, (but) we write unlimited blank checks for war. We just wrote a US$2 trillion check for that GOP tax cut and nobody asked those folks how they are going to pay for it. This report tries to cloak itself in an allegedly “academic” aura, and is essentially based on Milton Friedman’s economic system, an extremist free market and minimal intervention policy. Friedman’s thesis promotes the dismantling of public services like firefighters, police, libraries, schools, hospitals, or anything else that can save or help people that can’t afford it. The benefits go to a rich minority in society, to the detriment of the masses. The authors of this report conveniently fail to mention U.S. involvement in the murderous 60-year U.S.-backed blockade imposed on the Island, and of course, they refuse to mention the various achievements that the Cuban Revolution has accomplished. A 99-percent literacy rate, free education from elementary school through university, universal health care praised by the U.N., and one of the lowest infant mortality rates in the world. 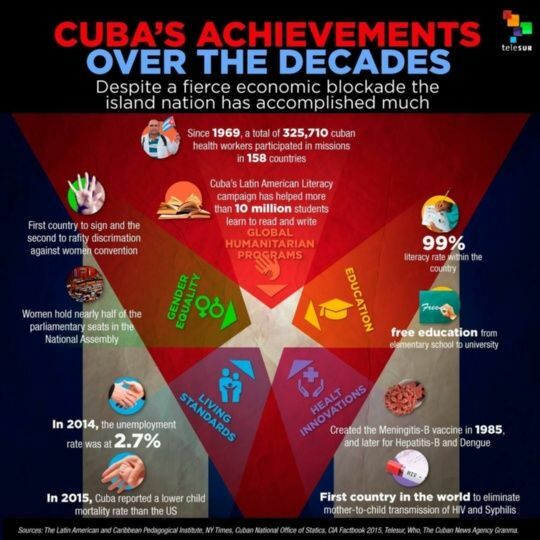 All of these achievements despite the genocidal U.S. blockade that has cost the island US$134.5 billion over six decades. The CEA report wants people to think that Cuba has no freedom, which isn’t actually true. Not only is there a solid democracy in Cuba, but also the basic needs of the country’s population are satisfied. “To many, freedom is an absence of worry. The desire and need for a social fabric knit well to support the basic prerequisites: food, shelter, health and education. None of them are a charity, because they are an investment in the fundamental source of a society’s well-being: human capital,” wrote Dr. Arshad M Khan in 2017. The report later takes on Venezuela, a country with “highly socialist policies (that) are peacefully implemented under the auspices of democracy,” to try and debunk the Bolivarian Revolution specifically, and generally the “XXI Century Socialism” or “National and Popular Projects” of the Latin American countries. “These countries are examples of a more general pattern of socialism’s negative output effects,” reads the report. However, it also, conveniently leaves out a staggering number of facts. First, it omits yet another murderous blockade and economic war waged by the U.S. against Venezuela; the same Venezuela that has built over two million houses for the poor, and who, with Cuba’s help, gave medical care to people who had never seen a doctor in their life; the same Venezuela that managed to redistribute for the sake of wellness and raise millions out of poverty. With sovereign initiatives enacted by President Evo Morales, Bolivia’s socioeconomic model used income from export resources to diversify the economy, created social programs managing the redistribution of riches, and the reduced of poverty over the last decade. The report also neglects to mention Argentina, Brazil, Peru, Colombia and Mexico, countries currently suffering under governments that unequivocally follow neoliberal recipes mainly backed by the U.S. and enforced by the International Monetary Fund (IMF). These right-wing governments lay the foundation for their economic model in inequality, disguised in free-market policies, and the idea that the state must not intervene—exactly the opposite of those qualities the CEA’s defines as “socialism.” Similarly, during the “golden” decade of neoliberalism in Latin America in the 90s, in which right-wing governments implemented Structural Adjustment Programs by the IMF and the World Bank and followed the wishes of their U.S. and Western European capitalist masters, the region became one of the poorest and most unequal in the world and also demonstrated poor or negative economic growth. Latin America has shown to the world, during more or less the past decade, that socialism can work and indeed, works better than capitalism. During the past few years (depending on which country we are talking about) the return of neoliberalism has brought back crisis, poverty, and inequality to the region.